When you are physically or psychologically injured and somebody else is at fault, you are entitled to compensation. A broken leg, sore neck or strained back are obvious; don't overlook the emotional impact caused by the fault of others as a result of their carelessness. This could result in your inability to sleep, your not being able to function as the man or woman you were before and your failure to provide for yourself and your family. These are all real injuries that you can receive compensation for—even without having sustained a physical injury. Can I Receive Compensation for Psychological Injuries? Automobile Collision. The most common circumstance is when you are injured as a result of a collision with a car or truck. The party that usually funds your award is ICBC. Negligent Cyclists. It could be because of a wild skateboarder or crazed cyclist. Here is an example of a man who was killed by a cyclist: Pedestrian, 80, killed in collision with cyclist. Hazardous Conditions. Injuries can also occur as a result of somebody not taking care to look after an obvious hazard on their property such as ice on a sidewalk or a stairway in the wintertime or leaving a cracked, uneven sidewalk exposed. Slip and Fall. This might include slipping on water or spilled juice at the grocery store. Products Liability. This could be the result of a glass breaking in your hand upon examining it while at the store. Collateral Damage. It could also be as a result of others fighting and you getting injured as collateral damage. It might even include an instance wherein you are injured because the bar or restaurant did not properly supervise and control other patrons or served them too much liquor. There are many ways in which you could be injured where you have a right to collect money from the others who are responsible. At Yearwood – Dyson* Lawyers, our personal injury lawyers and very experienced staff will take good care of looking after you and ensuring that you obtain compensation for your injuries. We will also help you get the medical treatment that you need and be your advocate through the bureaucracies at ICBC or other insurance companies. 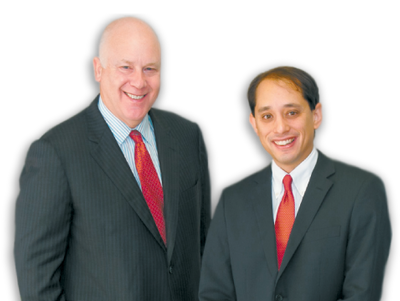 Patrick Yearwood has been practicing personal injury law since 1980 and Chris Dyson since 1998. They truly care for their clients and are passionate about obtaining the results you deserve for your personal injury. Want more information? Visit our Five Categories of Payment page. Give us a call at 604‑513‑2333 or email pyearwood@bclaw.bc.ca or cdyson@bclaw.bc.ca. The first meeting is free. We would like to help you and you will not have to pay us anything until we collect. We fund all of the money necessary to pay for doctors' reports, which is often several thousand dollars, and for court filing fees and the many other costs involved in making sure we have the evidence to get you all that you deserve.